Some people make New Year’s resolutions to lose weight, or to practice better dental hygiene, or to found a university. 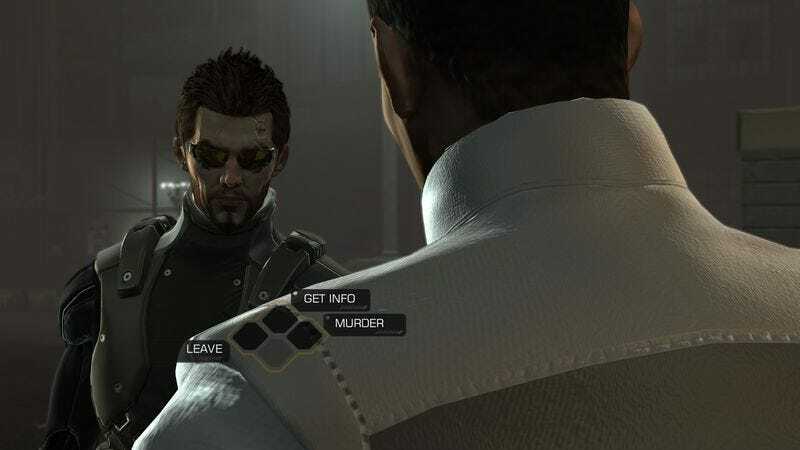 On January 2 of this year, though, a dedicated player of the 2011 action game Deus Ex: Human Revolution undertook a less noble but more entertaining journey: to kill every last character (or close to it) in the game’s sprawling world. Anyway, DXHR is a fun endlessly-replayable game and I wanted to put an interesting spin on my next playthrough. So a comment from a pal on Steam had me wondering, could I kill absolutely everybody who was killable? Not just guards and whatnot, I mean every single resident of the hub worlds? I knew Sarif HQ and LIMB clinics were off limits as at these locations you are unable to draw your weapon or perform takedowns. But outside these places, everybody is fair game. It might sound depressing, but the 16-post epic is consistently funny, with plenty of goofy screenshots and puckish commentary. Plus, you get to look at corpses. “This is even more painful than it looks” corpses.